Updated: 2015-10-02. Something not right? Please update the information. Hiking trails, pioneering supplies, sports field. Rustic location with three kybos and an open-sided dining/cooking shelter. Spars and staves are available for pioneering or shelter building. In the winter, the snow many almost a metre deep, making it ideal for building snow shelters. 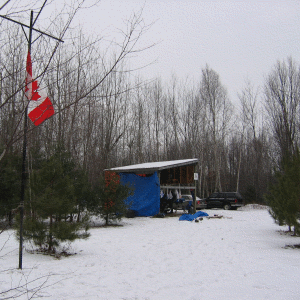 There are four separate campsites with their own fire pit and an open field with a flag pole. The camp is a 300 metre walk from the main road.